If you would rather watch than read. 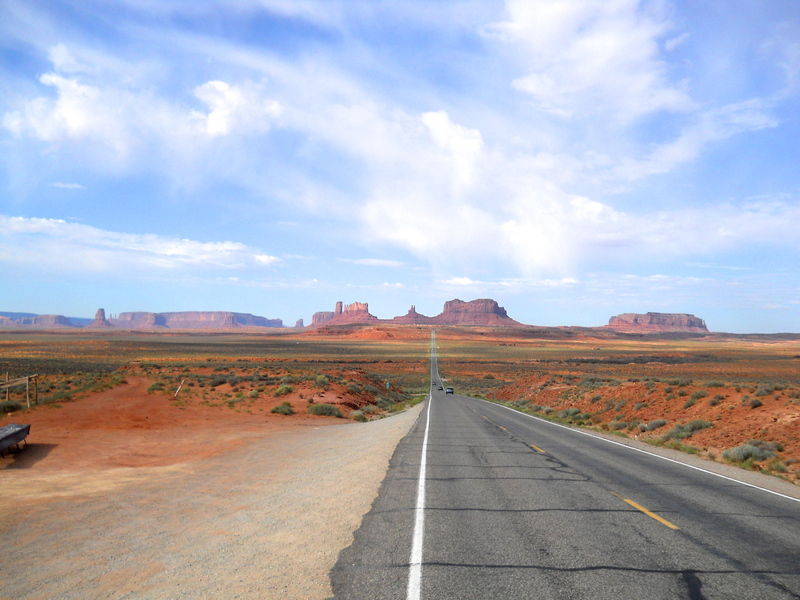 But we are on our way to Sedona, Arizona. 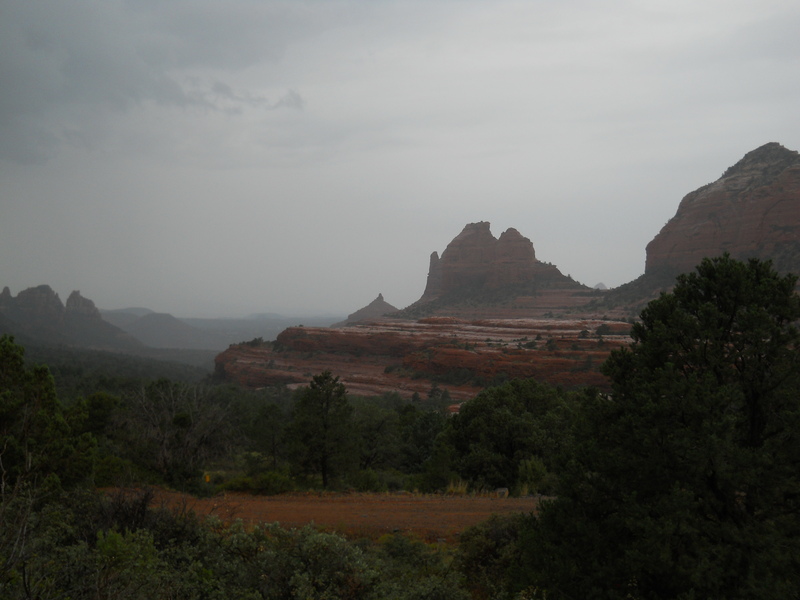 I had always saw pictures and read about Sedona. 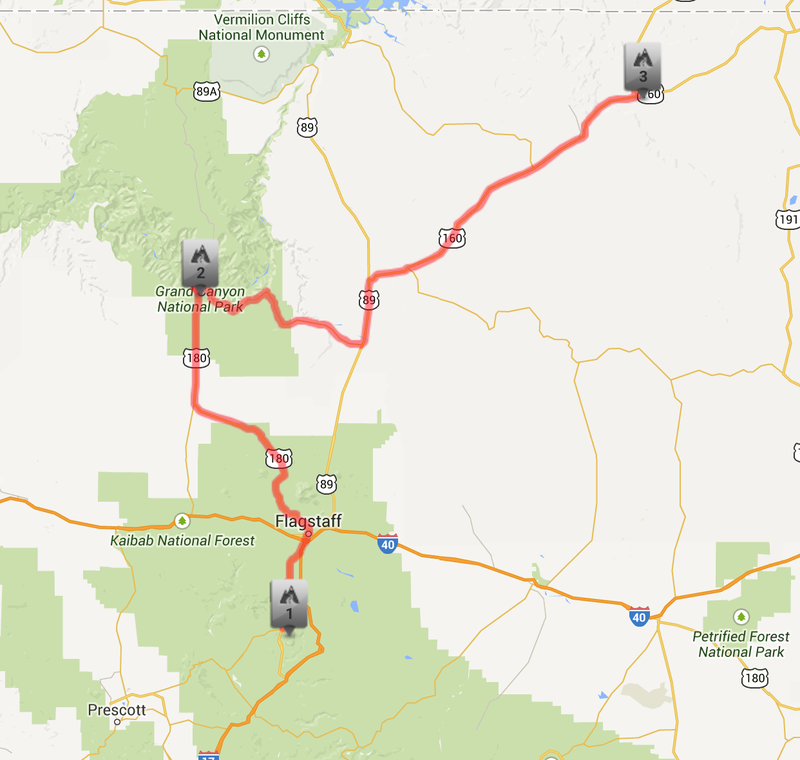 From Flagstaff you have a couple of options as far as route goes to get to Sedona. 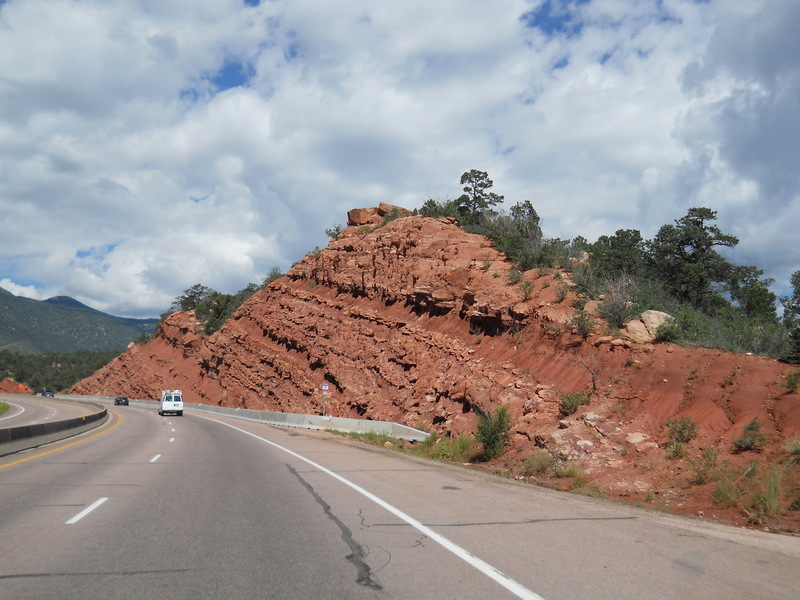 Scenic is always my first choice so it’s 89A from Flagstaff to Sedona. 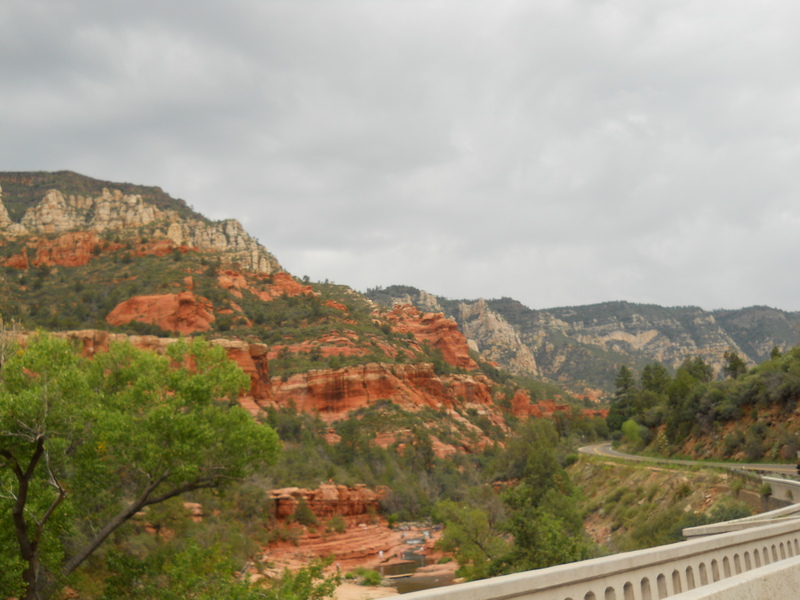 We could have taken Interstate 17 down to Sedona, but we would have missed the canyon and the winding road. 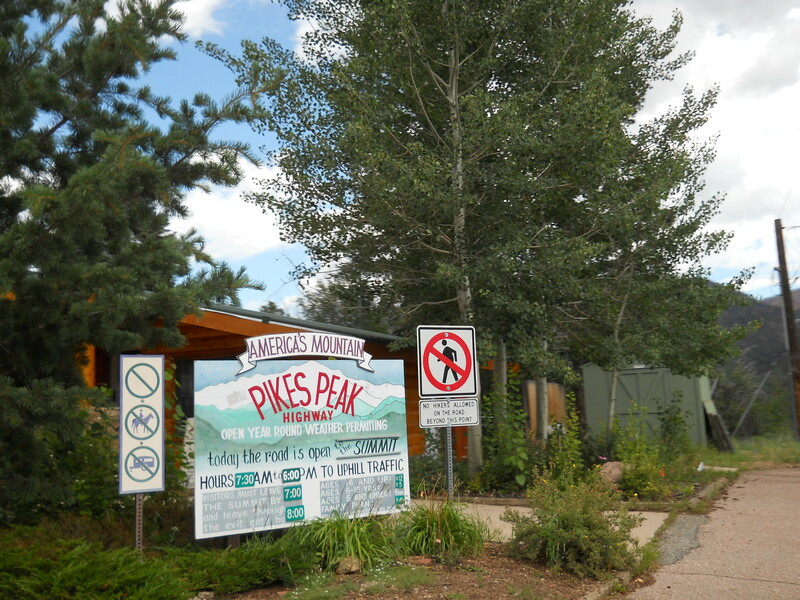 We stopped at a information center and talked to a Park Ranger. He provided us with some good ideas for our stay in Sedona. 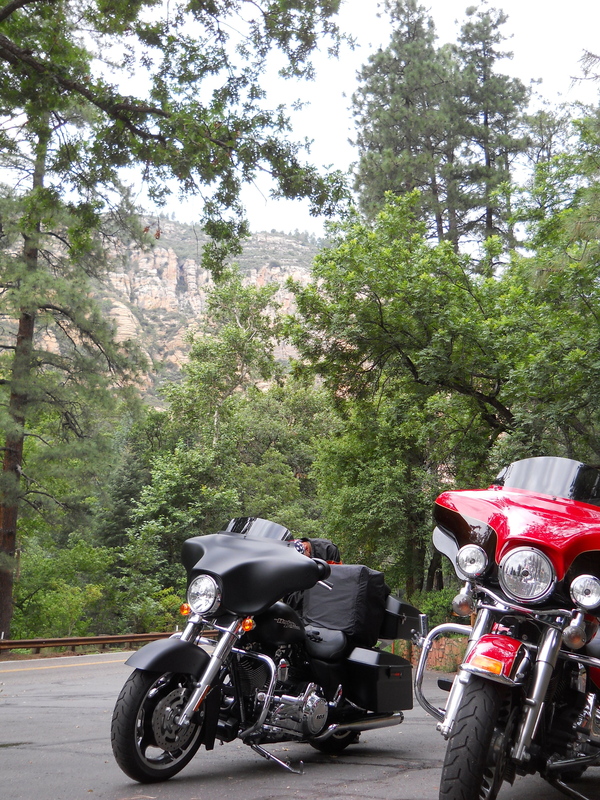 We had only traveled about 30 miles to Sedona. The view coming into town was wonderful! The weather started to change for the worse. We checked in at the Orchard Inn and surprisingly was a lot cheaper than I expected. About $160. per night. 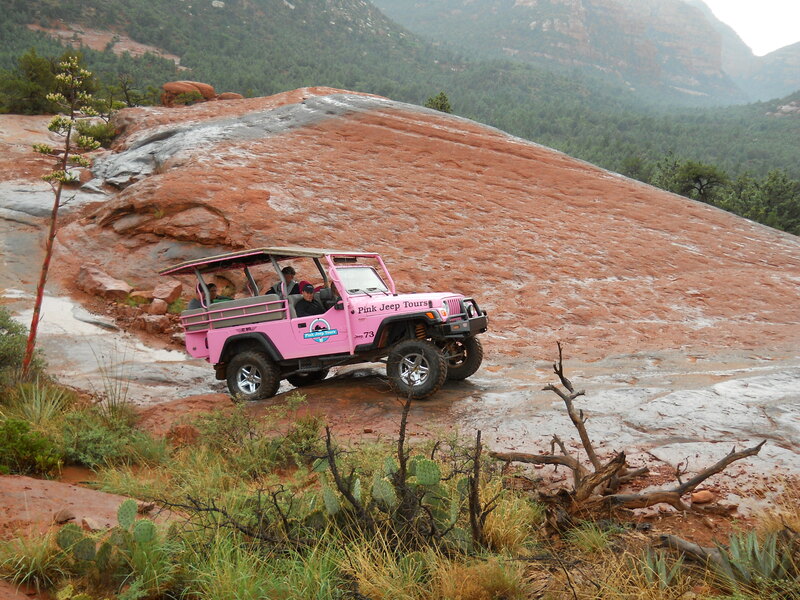 Pink Jeeps down the road from the hotel on the main street offers guided tours out into the Red Rock Country. We decided to go for it and we are glad we did. Our driver was outstanding, safe and knowledgeable. Lance, I think was his name. Retired from his job and moved out here to enjoy his retirement, Can’t blame him for that. I would like to have stayed. 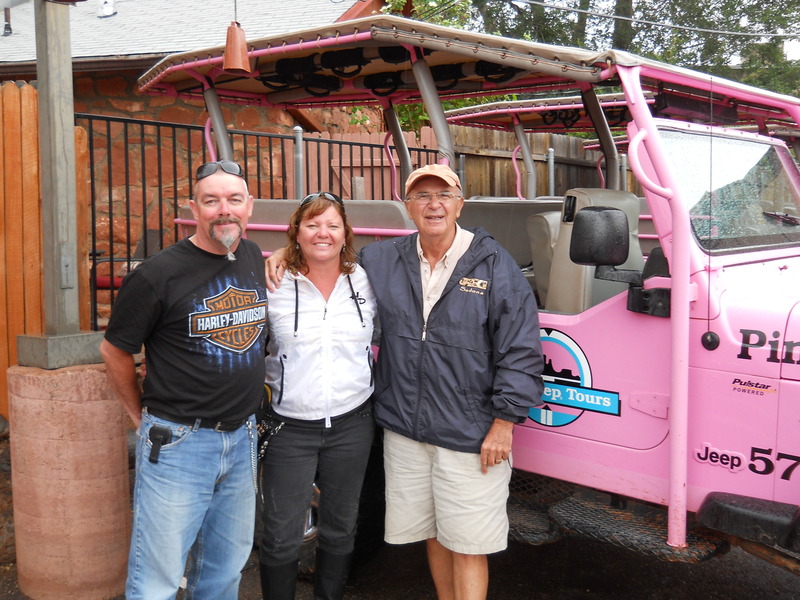 After the pink Jeeps it was off to explore some more of Sedona. 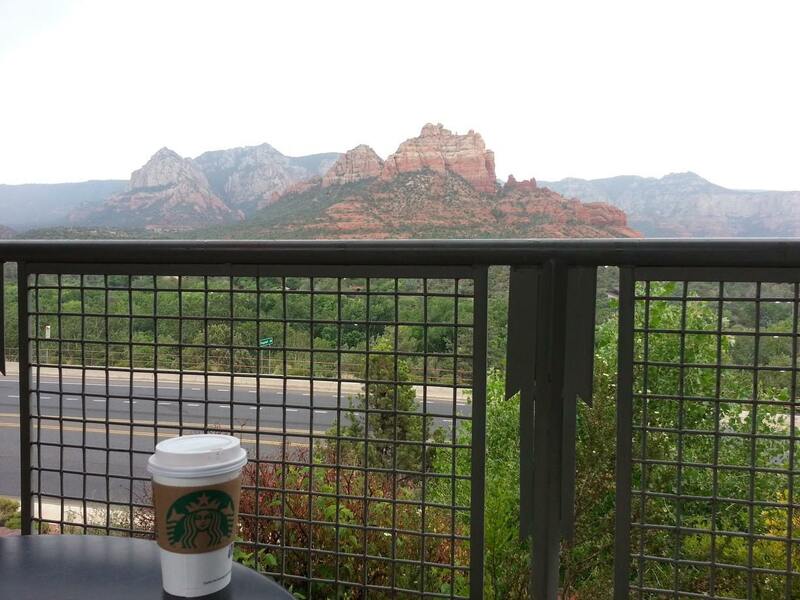 We discovered a Starbucks with a view. After some exploring and a good dinner at the Oak Creek Brewery and Pub. If my memory serves me I was not feeling very hungry which is unusual for me. 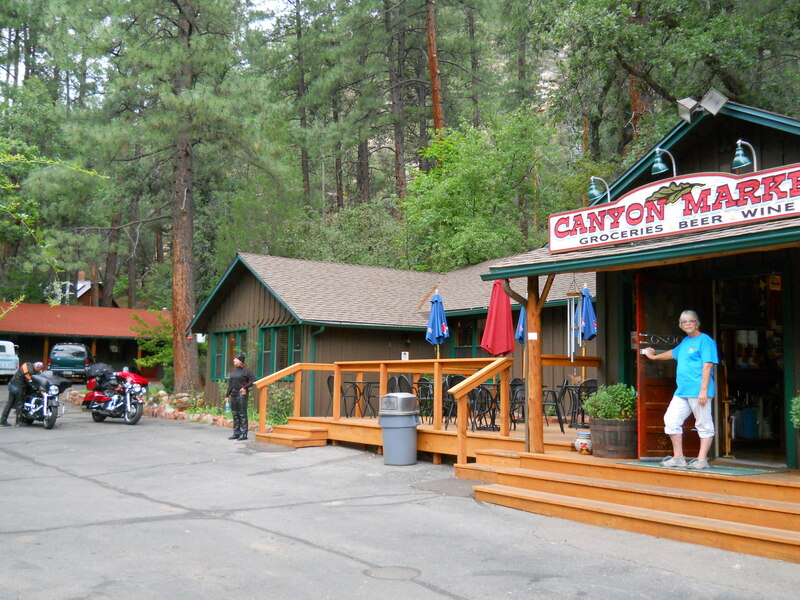 All was good, after spending some time in the pool and a good nights rest we are heading out in the morning to explore around Sedona. 38 miles total for Day 5. 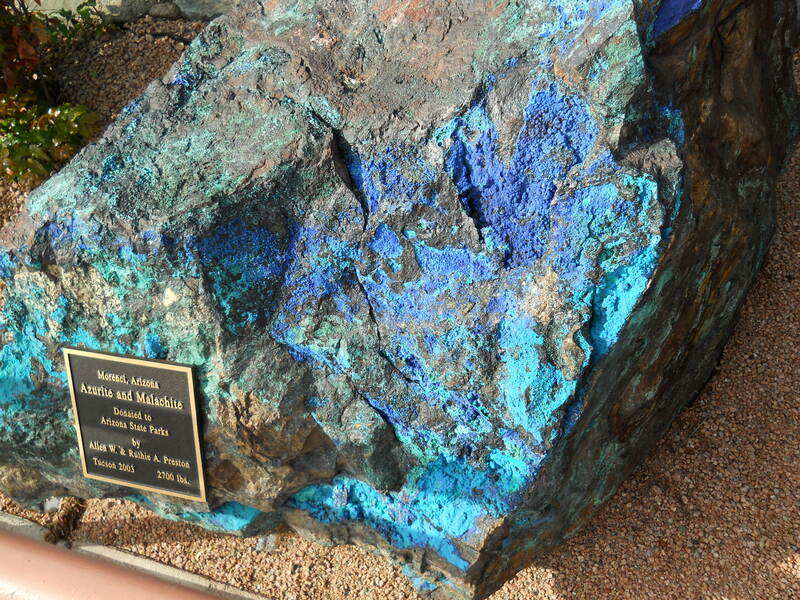 Jerome is or was a ghost town, an old mining town. 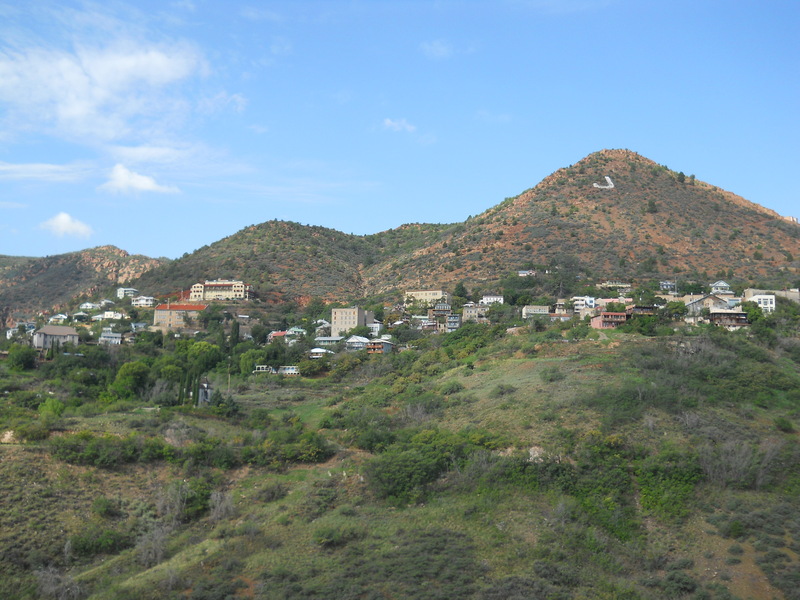 In the 1970’s some people, some might say Hippies started to come back and buy property and restore Jerome to a lively tourist spot. 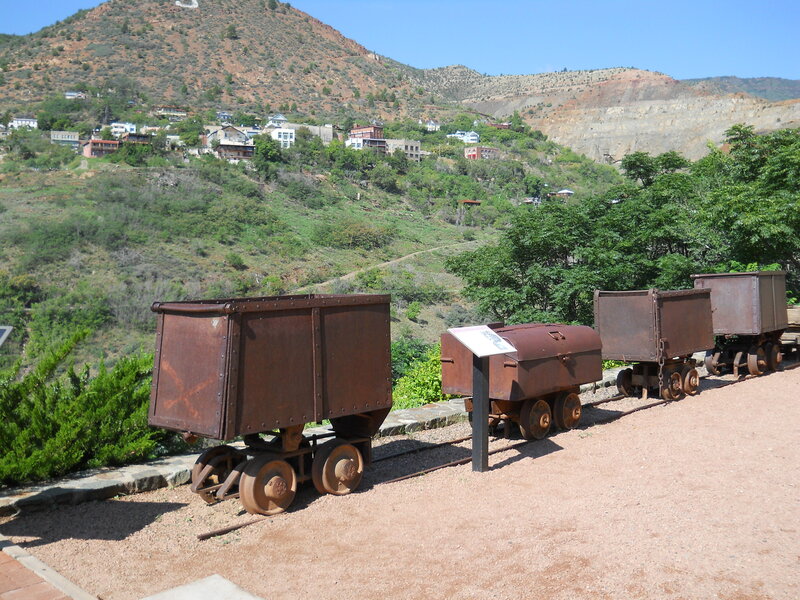 Jerome is home to the Sliding Jail and home to copper and gold mining operations. 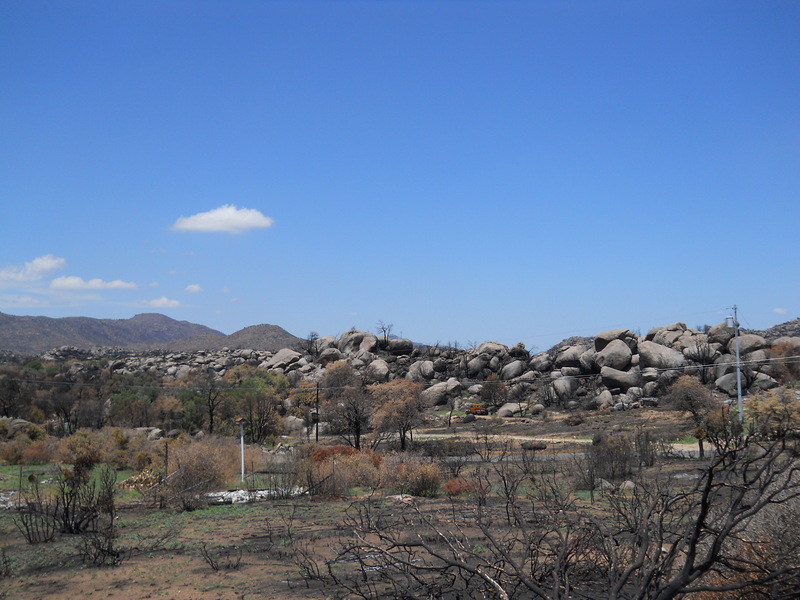 We also went through Yarnell, AZ. 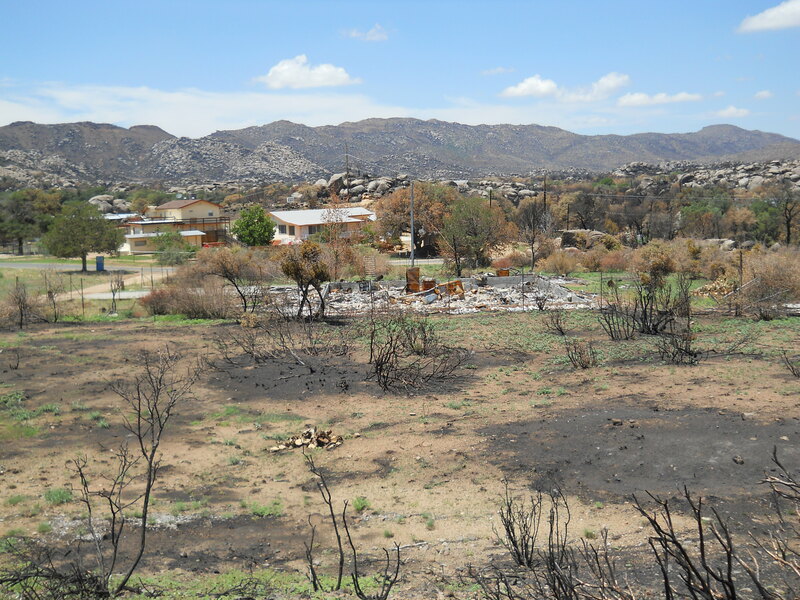 On June 28th, 2013 lightning started a wild fire that was fueled by high winds and blowing embers, that overcame 19 brave Firefighters. This was a strange place, geographically it didn’t look like there had been anything to fuel the fire. 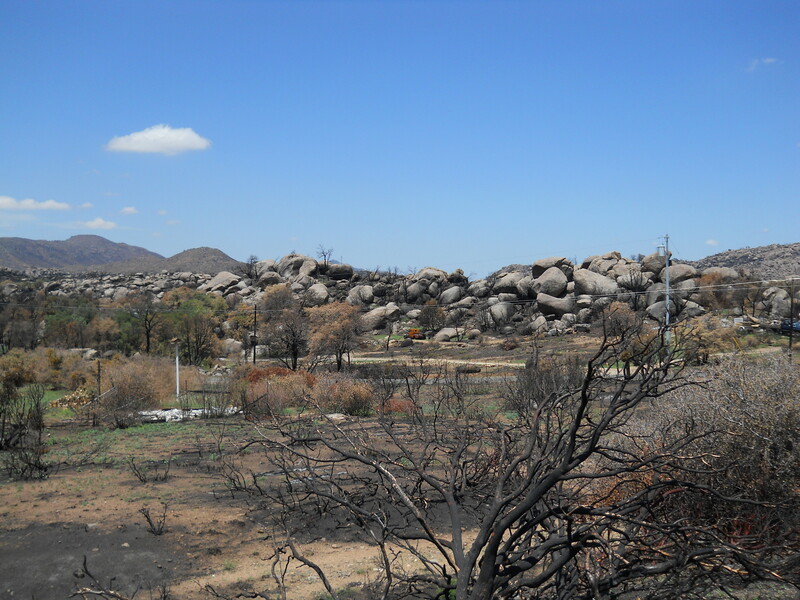 Yarnell reminds you of a scene from the Flintstone’s. 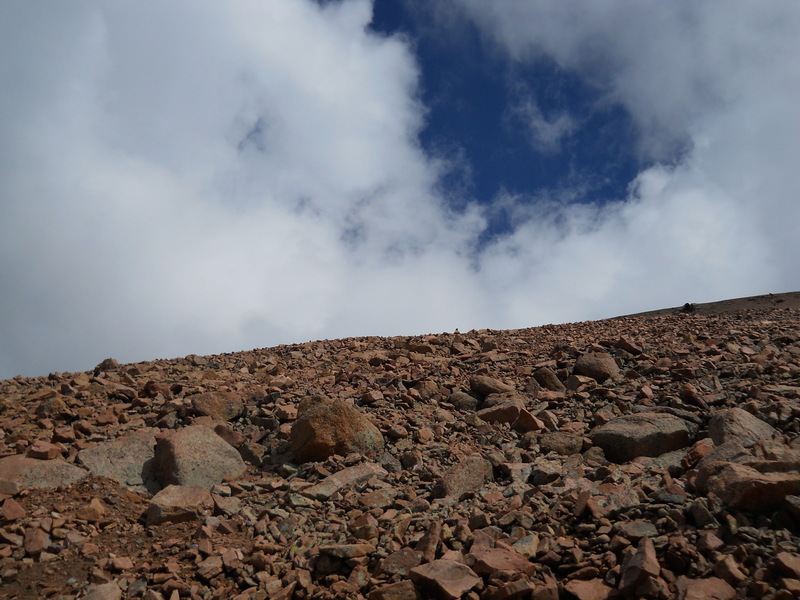 Large boulders all around the place. 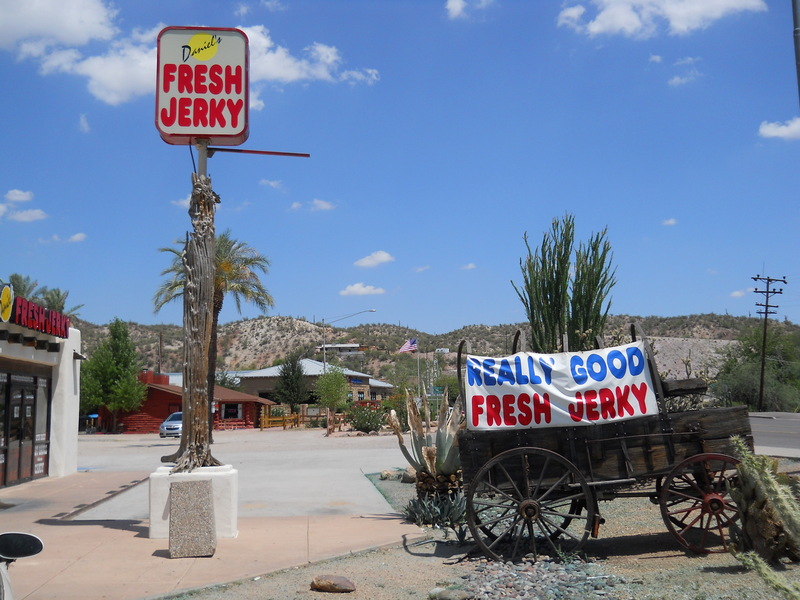 We also went through Prescott, AZ and stopped in Wickenburg for some jerky and water, more for the water because it was extremely hot just north of Phoenix, AZ. The temperature today was 101.F I guess that was cool since the average for this time of year in Wickenburg is 107.F and the record high is a sweltering 114.F so even though it was extremely hot to us northern folk I am just glad it wasn’t 107. 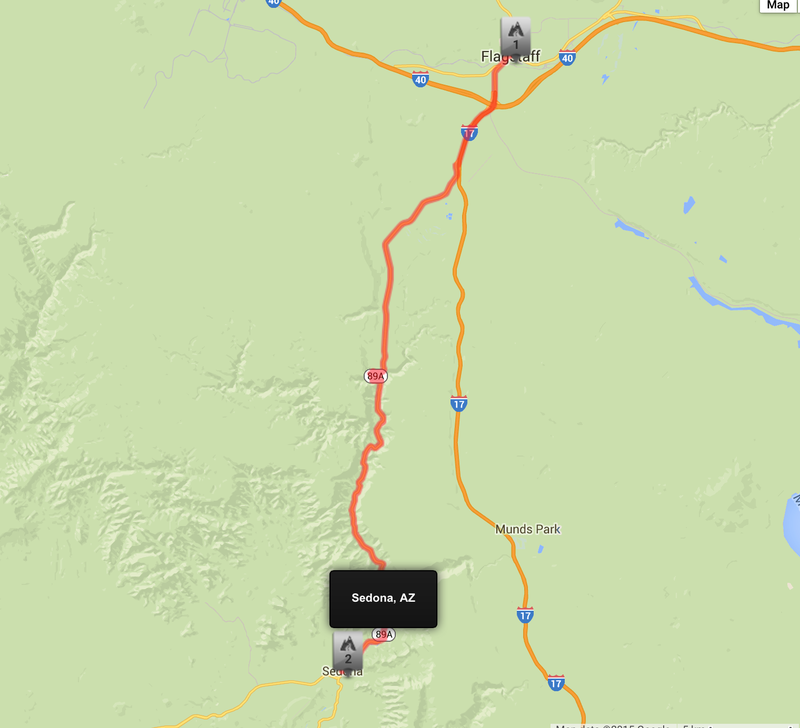 The ride back to Sedona was a long one since we shot back up the Interstate part of the way. Interstate riding is boring for me. But the hotel pool awaits. This day would be the day we go to the Grand Canyon! I have never been. 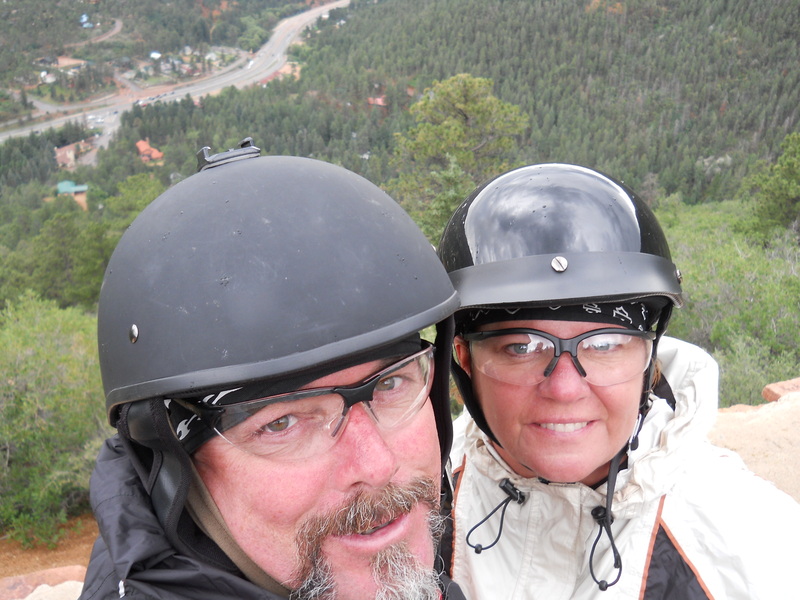 We were excited about maybe renting a helicopter and taking some scenic tours. 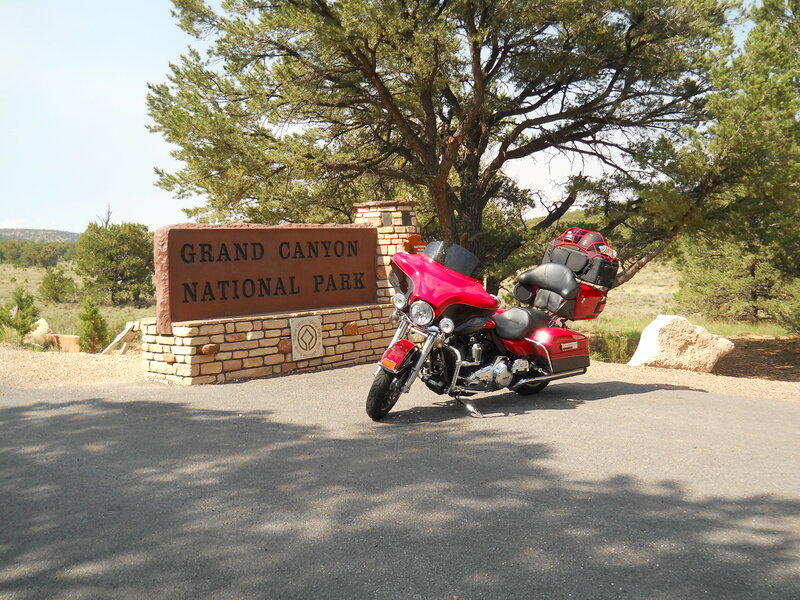 The ride north to the Grand Canyon was a nice ride. 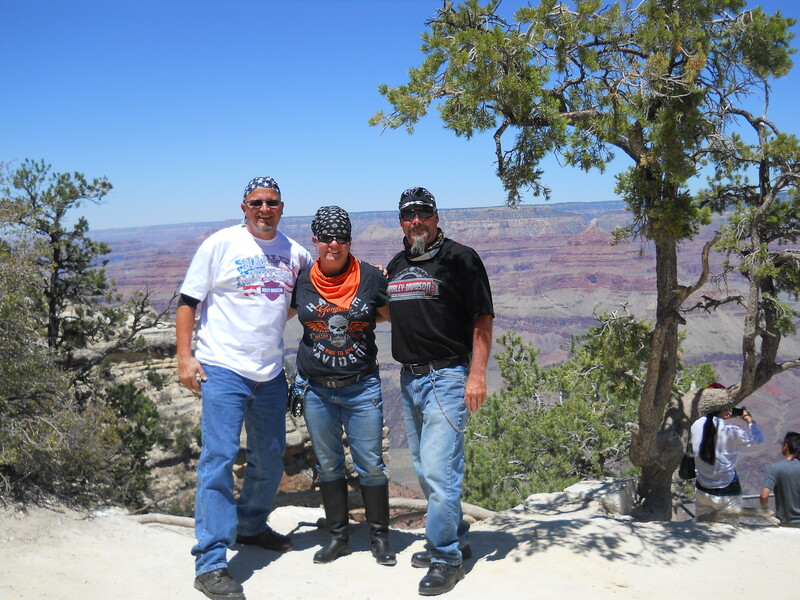 If you have never been to the Grand Canyon, It is a must do. And keep track of your kids, there was a small child running wild around the edge of the canyon and the fence does not stretch the entire length, so it was a little nerve racking seeing this kid running wild so close to the edge. We got there to late for a helicopter tour. They book up early. 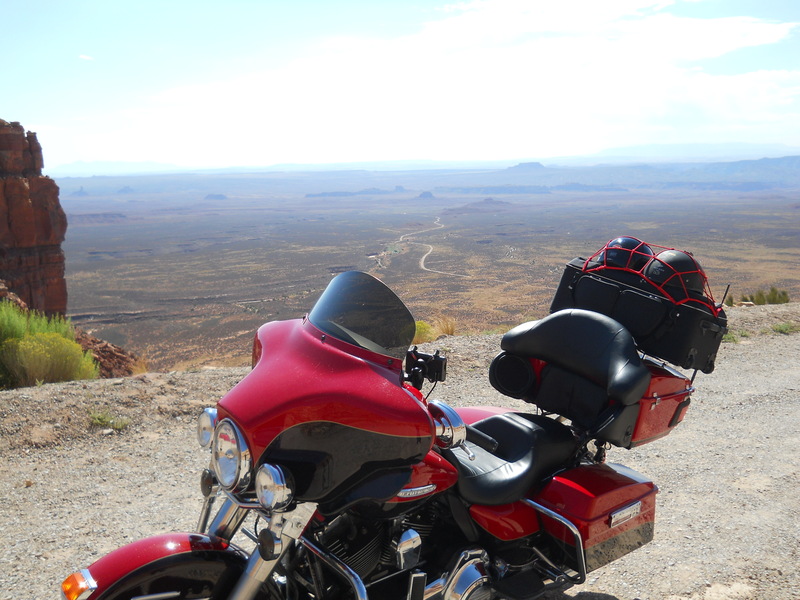 After the Grand Canyon it was off towards Mexican Hat, Utah and the Moki Dugway. 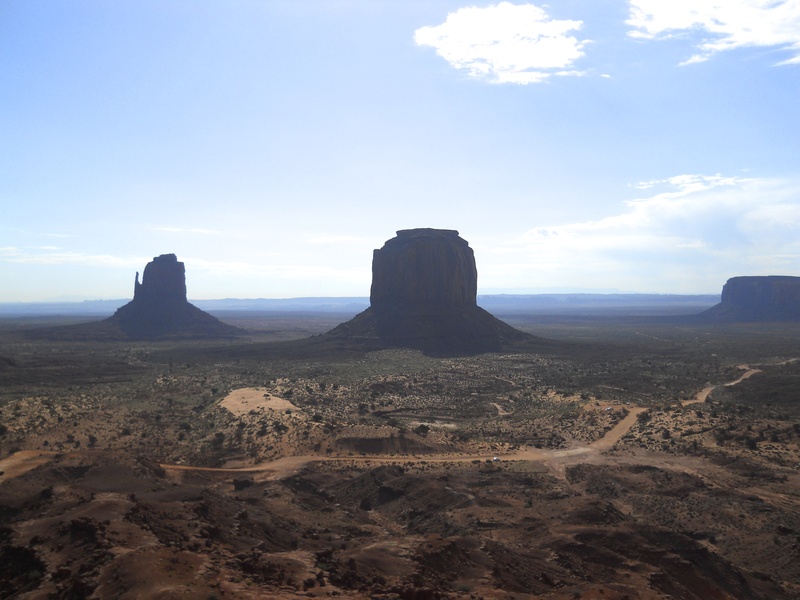 We made it to a town named Kayenta only to find out there hotels where all booked for the night. 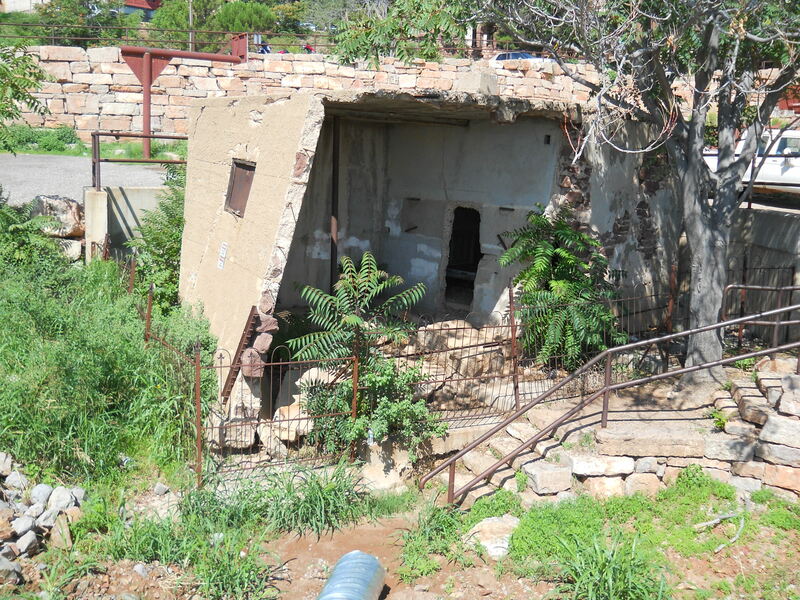 We had passed a hotel that didn’t look all that inviting back on the reservation called the Anasazi Inn. We had no choice but to stop for the night the sun was beginning to set on us and we had covered some ground today. 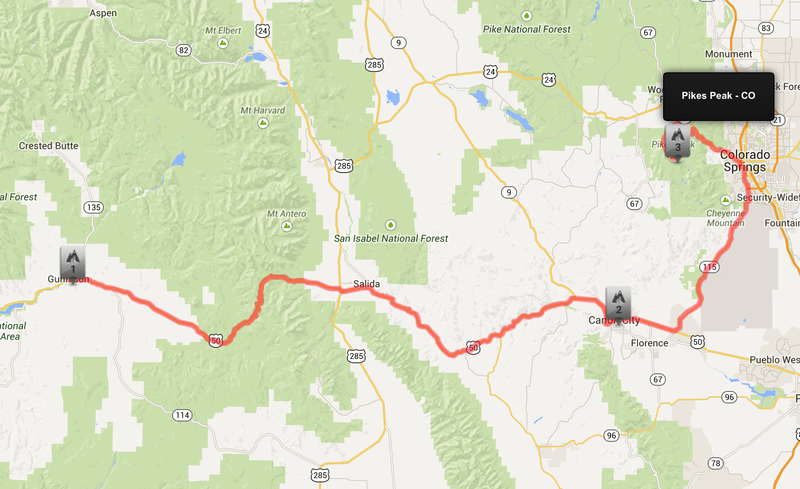 284 miles with a lot of stops for sight seeing. Locked and loaded Anasazi Inn here we are. 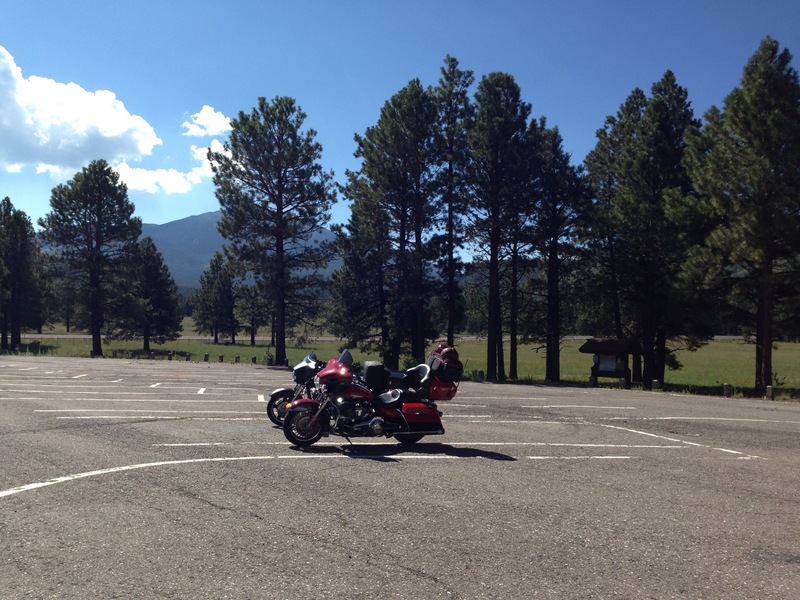 we parked the bikes as close as we could get them to the room. All in all it was not so bad. Back into Kayenta for breakfast at the McDonalds with the stray dogs wondering the parking lot and the surge of tourist with campers and RVs. But inside the McDonalds is a very cool display about the Navajo Code Talkers from WWII. 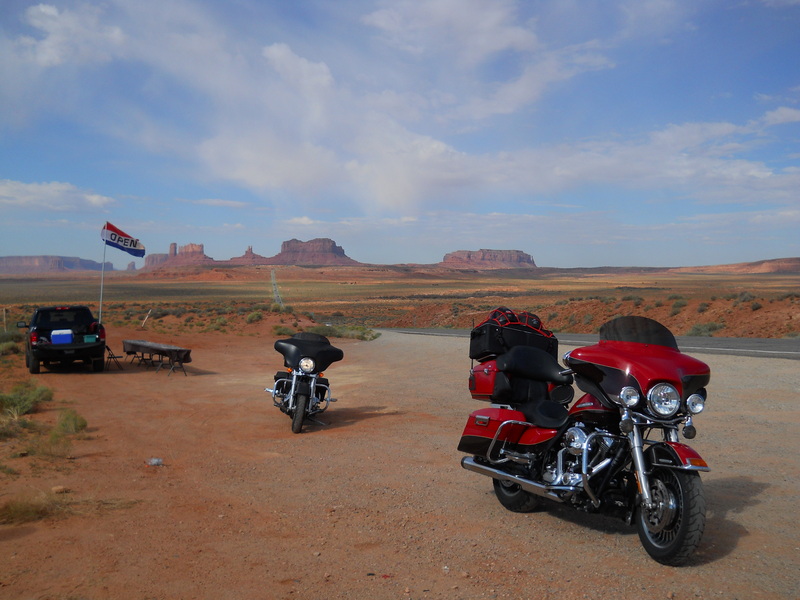 After breakfast down the road to Monument Valley. 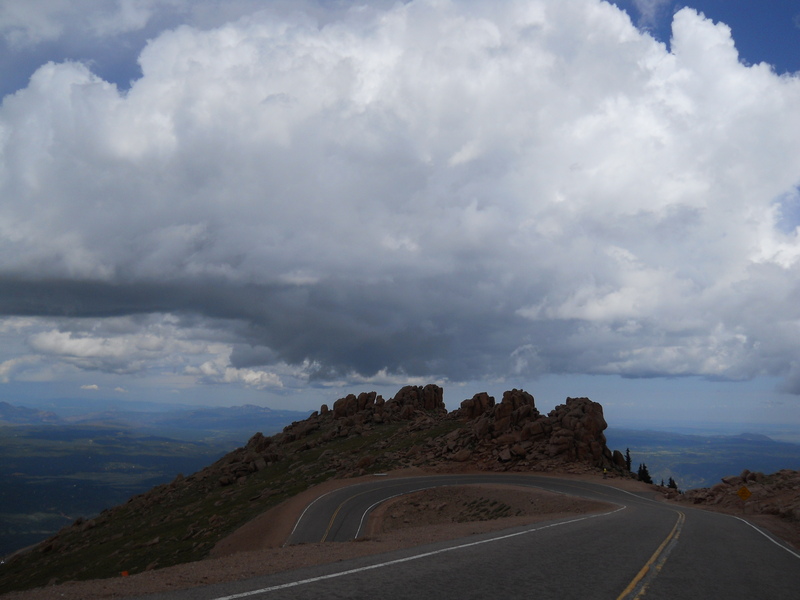 Notice the road in the photo and a small white speck on the road just right of center, thats a 12 passenger van. Just for scale. 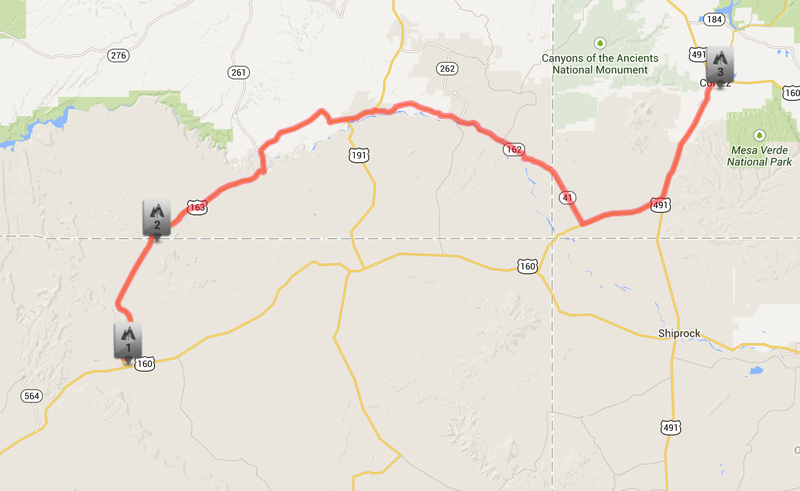 Next up the road featured on the Discovery Channel as a Hell Road- the Moki Dugway. 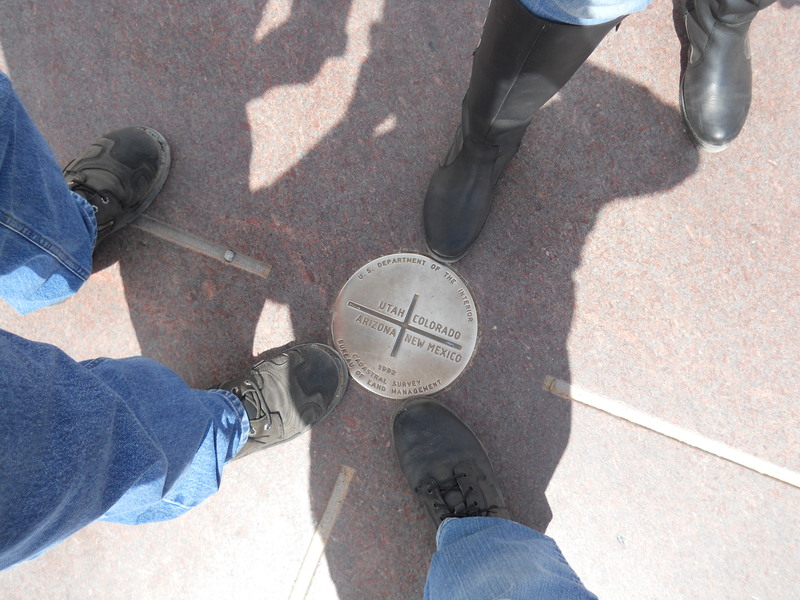 After surviving the Moki, we headed towards Four Corners Monument. This place is remote and out there! 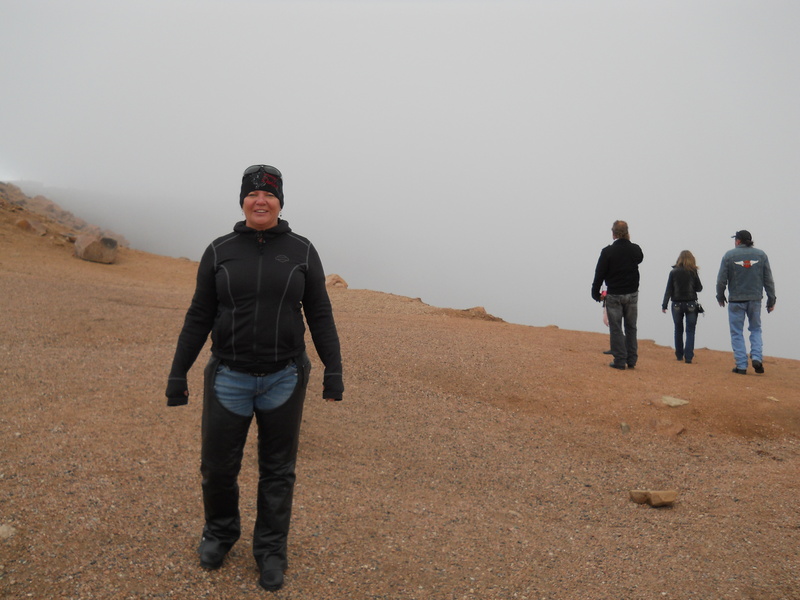 Carla standing in Utah and Colorado at the same time. 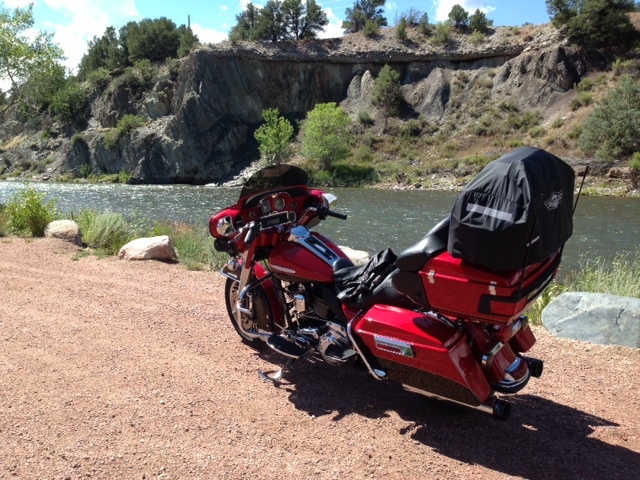 We ride on into Cortez, Colorado for the evening. 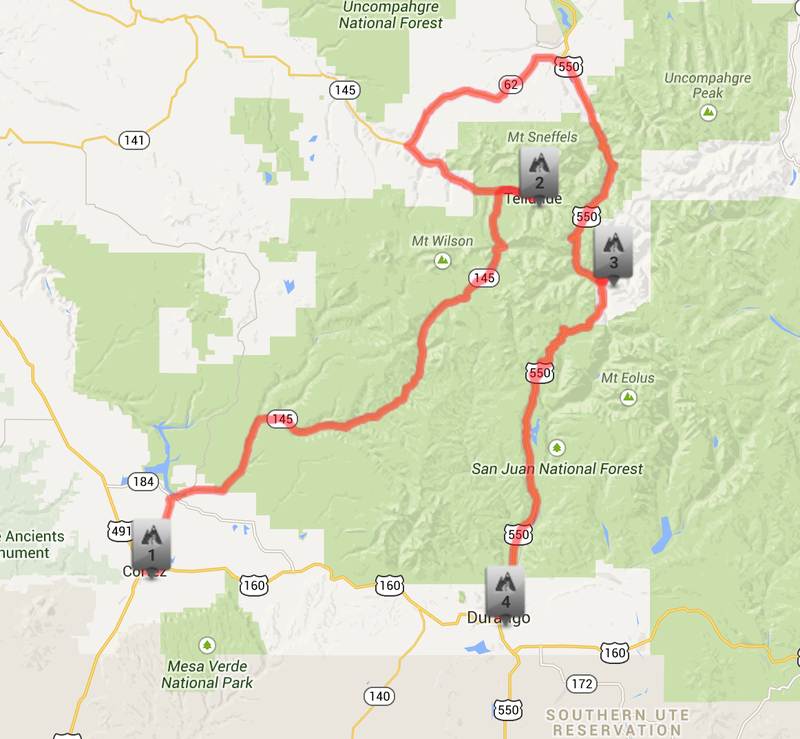 Traveled the San Juan Skyway and into Dolers, Rico, Telluride and Ridgeway. 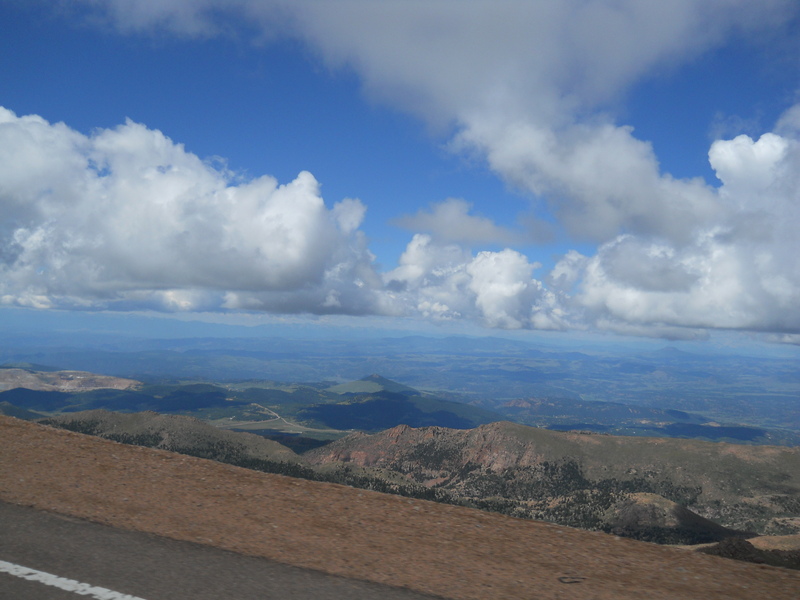 Up in elevation about 10,000 feet above sea level the air gets thin. 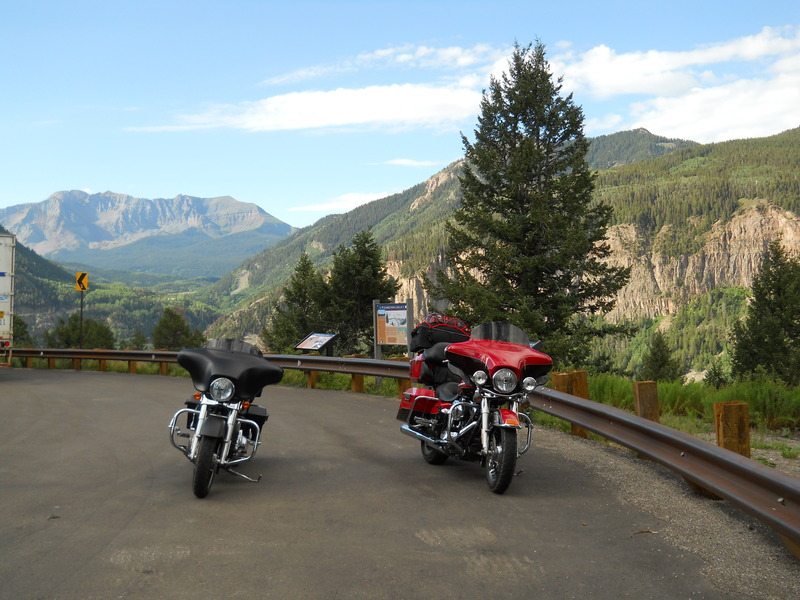 Took the Million Dollar highway through Ouray and Silverton, Colorado. 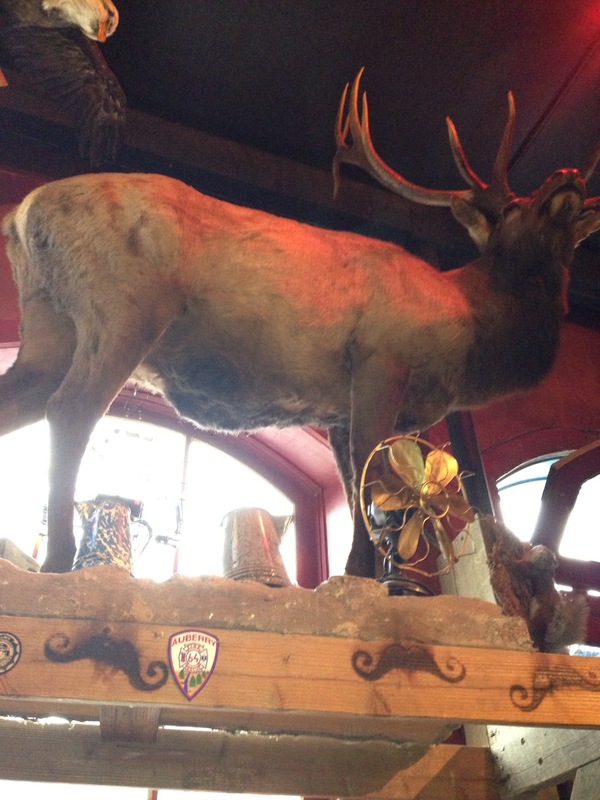 In Silverton we stopped to eat at the famous Handlebars Saloon. It was while we waited to eat that the thunder started and the rains came, cold, cold rain. After eating we suited up! For the rain and the cold, what we didn’t bring was snow shoes. At the gas station before leaving town cars came in with snow covered windshields and told us “you can’t go down the mountain there is 4 inches of snow on the road. 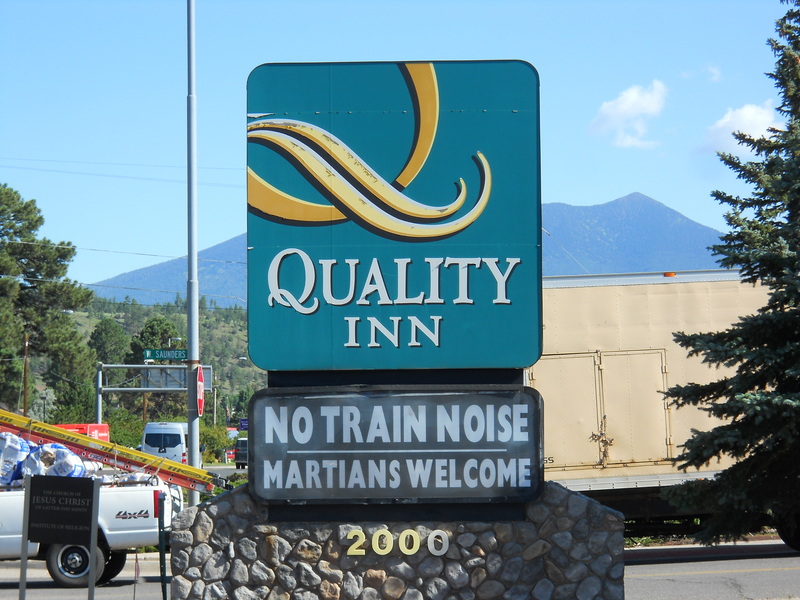 Oh we are running out of daylight and there are no rooms to be had in Silverton. 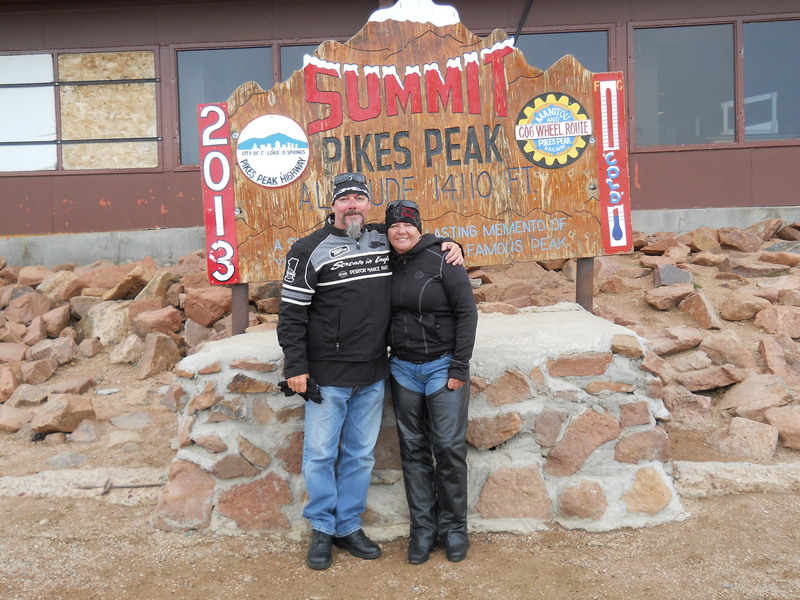 We waited at the gas station with some others on bikes all the while debating on what to do, when up the road, from the direction we need to go comes a guy on a Softtail with Colorado plates and he says he lives just down the road and we could make it down the mountain if we where careful and stayed in the tire tracks from the cars. I have no pictures or video of this because I was afraid to get out of the tire tracks to pull over for pictures and Carla was holding on to tight to take any. This would be the longest 50 miles of my biker life. 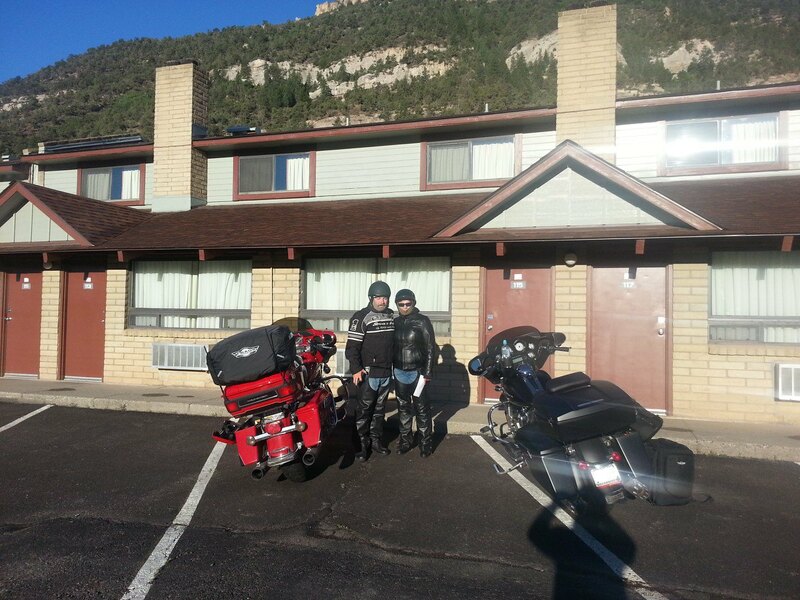 We made it to Durango and checked in to the Iron Horse Inn Durango. Did some laundry and ordered pizza. 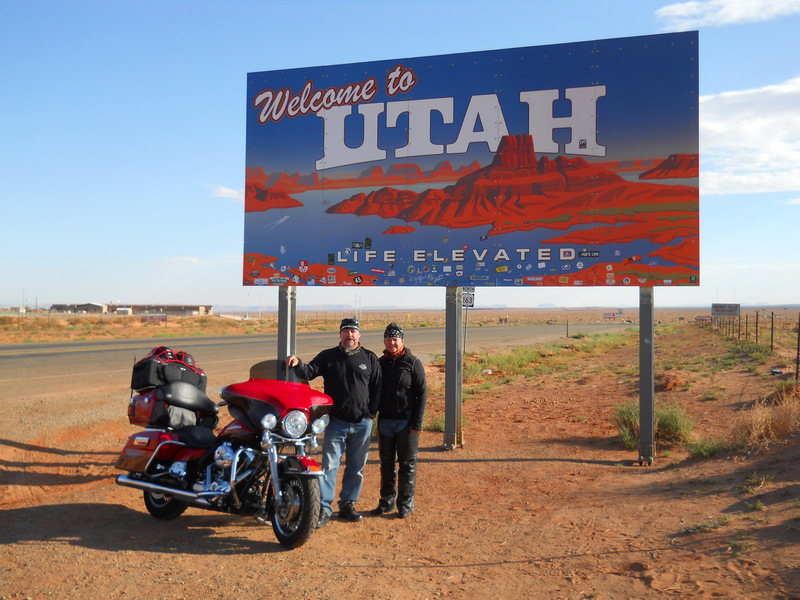 While doing laundry we met a couple guys from Australia, that rented Harleys and had been traveling the USA. 201 mile for the day with the last 50 taking a few hours. 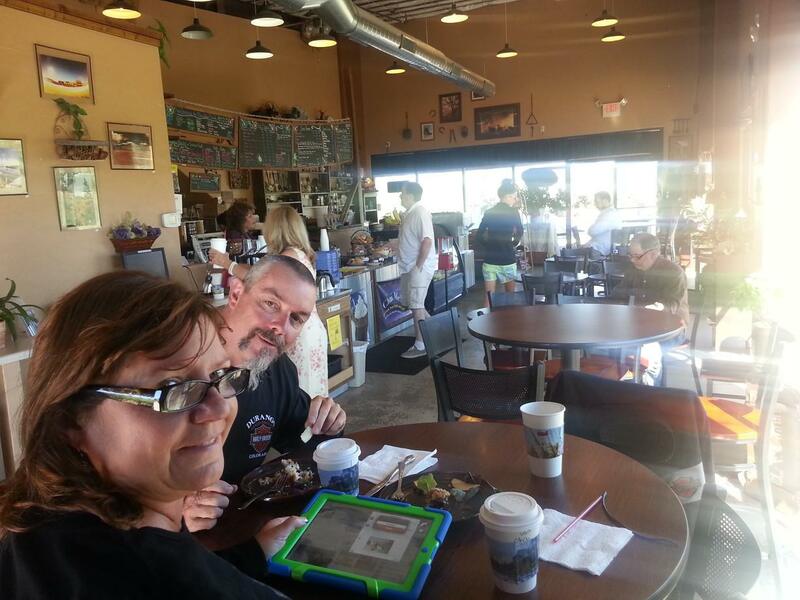 Started the morning in Durango, Colorado. 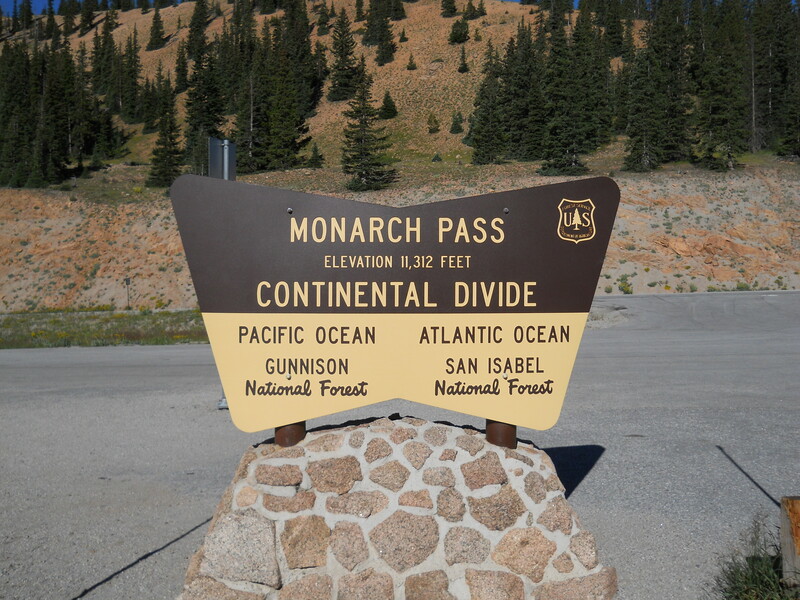 The temperature was a brisk mid 40s F.
Out to Pagosa Springs and over Wolf Creek Pass. Needed some warm coffee after the cool start to the day. 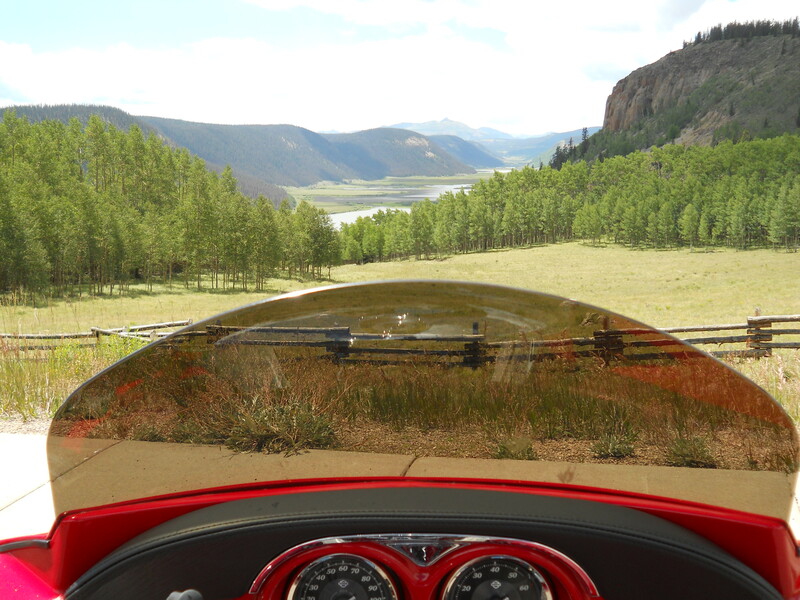 Colorado has some of the best motorcycle roads in the U.S. Surrounded by mountains and valleys. thats how good the riding is you never get tired. The ride was never ending amazing! 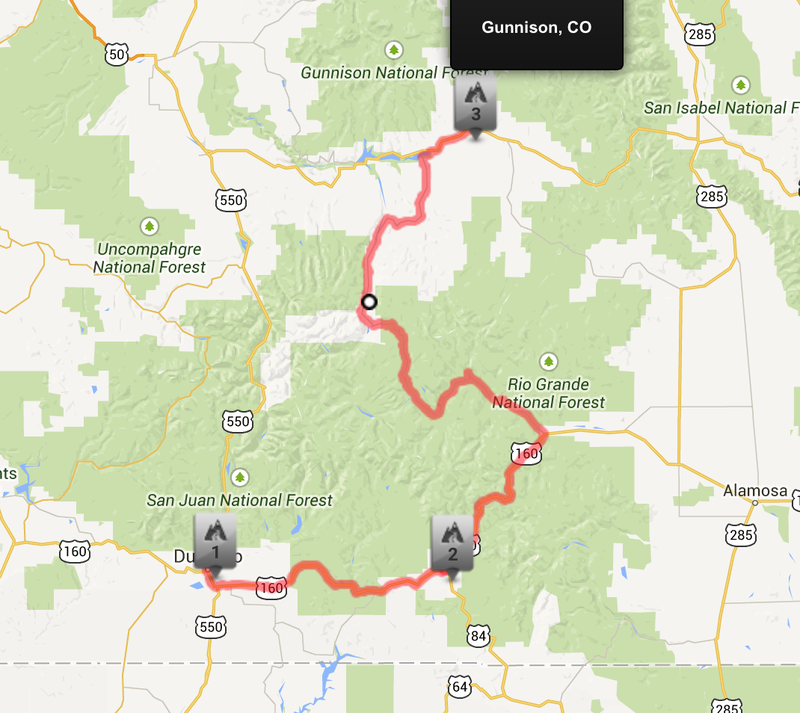 Gunnison to Colorado Springs and Pikes Peak. Coming down is another story. Freezing rain and cold and gravity = white knuckle ride. 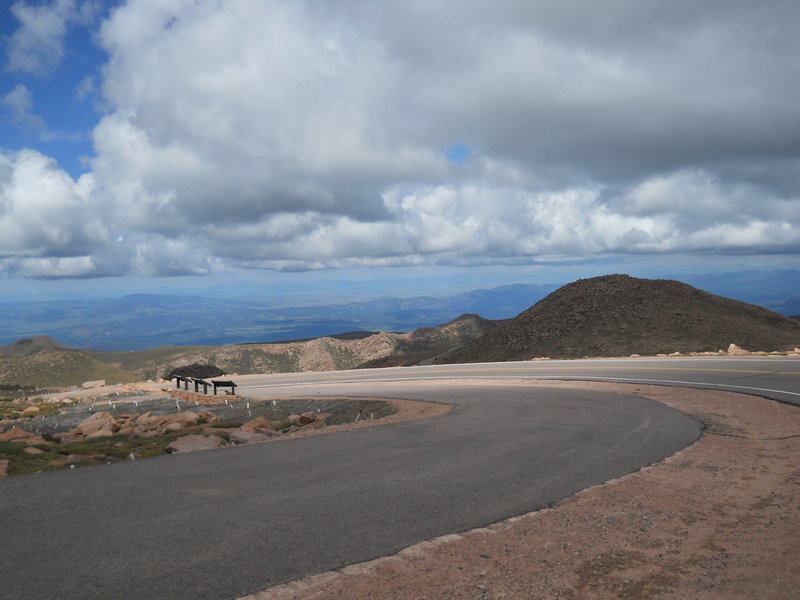 Yes thats how steep it is!!!!! Happy to be down out of the clouds!!! 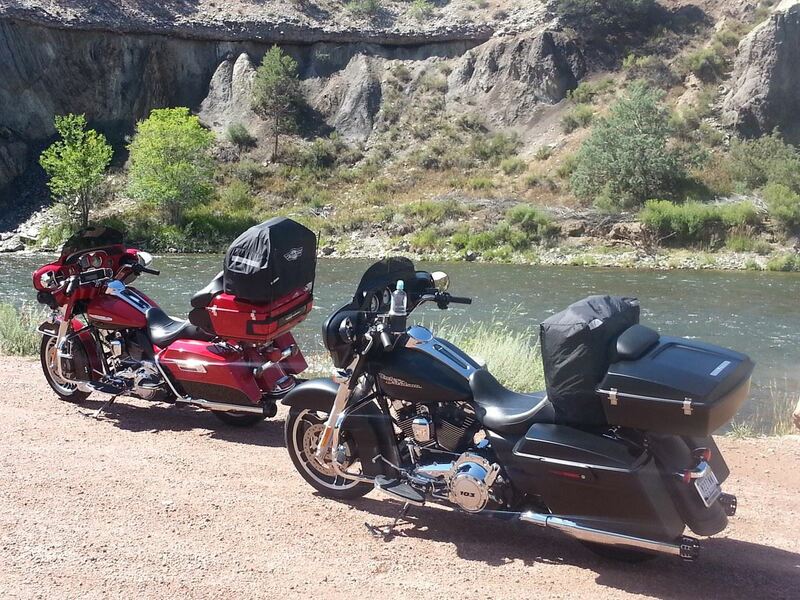 Big Harley Adventure as Kirk named it. For years in the future we will travel and explore this vast wonderful land. Amazing photo’s, great narrative and a such an emotional undercurrent holding it all up. 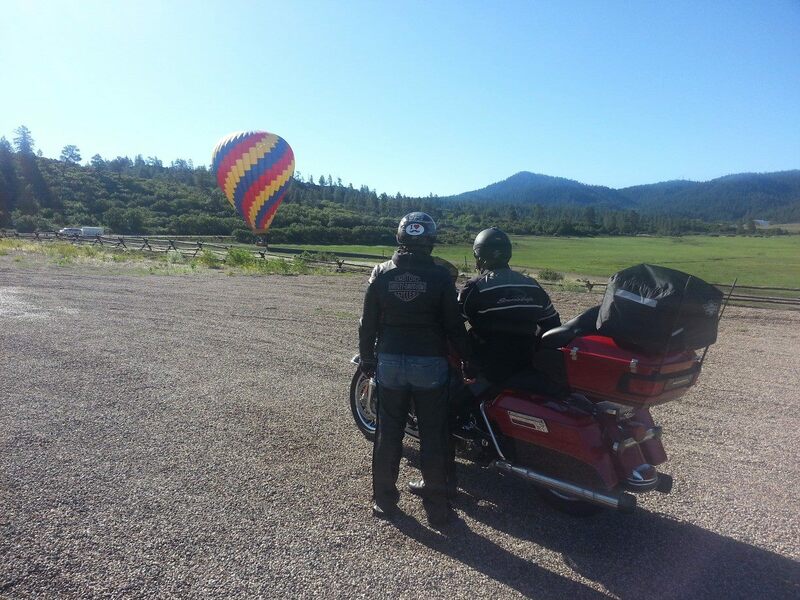 You certainly deserved the ride of your life, in many ways! Thanks Dookes, This would be the beginning of our annual road trip my brother-in-law name BHA with the year ( Big Harley Adventure) I am working on the BHA 2014 trip post now.